Meredith Monk, who was recently awarded Musical America’s Composer of the Year, is having one of the busiest springs in her 45-year career. A standout in the whirlwind of events is the upcoming world premiere of “Realm Variations,” which was commissioned by the San Francisco Symphony’s 2012 American Mavericks Festival. The work will debut in San Francisco’s Davies Symphony Hall on March 18, followed by performances at the University of Michigan’s Rackham Auditorium on March 25, and then at Carnegie Hall’s Zankel Hall on March 30. Marking one of her rare performances of other artist’s works, Monk will join Joan La Barbara, Jessye Norman and members of the San Francisco Symphony for performances of selections from John Cage’s witty and evocative “Song Books.” The concerts are scheduled for San Francisco‘s Symphony Hall (March 10 and 14); Hill Auditorium at the University of Michigan (March 23) and Carnegie Hall on March 27. Performance and Art” publisher/editor Bonnie Marranca will moderate the talk at 7pm. February 19 marks the release of “MONK MIX: Remixes and Interpretations of Music by Meredith Monk.” Among the artists appearing on the 2-disk CD set are Björk, DJ Spooky, Ryuichi Sakamoto, Lukas Ligeti, Lee Ranaldo, Nico Muhly, Caetano Veloso, Don Byron and Vijay Iyer. A release party will be held at Joe’s Pub on February 19 at 9:30pm with live performances by DJ Spooky, Don Byron and his clarinet quartet, Theo Bleckmann, John Hollenbeck, DJ Rekha, among others. WQXR radio’s Terrance McKnight will serve as the evening’s host. Celebrated for using the voice as an instrument, Monk says that it was her 2003 commission from the New World Symphony that inspired her to also explore the possibilities of instruments as voices. “Realm Variations” embodies both pioneering efforts. Divided into three distinct sections or “realms” that interweave as the work progresses, “Realm Variations” initially highlights the high treble sound of the piccolo (Monk’s first use of the instrument) balanced by the contrabass clarinet and bassoon. The viola, French horn, harp and violin, as well as six members of Meredith Monk & Vocal Ensemble comprise the rest of the chamber ensemble. In May, Monk heads to Europe with her Vocal Ensemble, for performances in the Lublin Philharmonic/KODY Festival in Lublin, Poland on May 14; at Le Collège des Bernardins in Paris on May 16; at Musée du Louvre in Paris on May 18, and Centre Culturel André Malraux in Vandoeuvre-les-Nancy on May 20. In 1965, she began her innovative exploration of the voice as a multifaceted instrument and subsequently composed and performed many solo pieces for unaccompanied voice and voice/keyboard. In 1978, she formed Meredith Monk & Vocal Ensemble to further expand her musical textures and forms. Her vocal music is an eloquent language in and of itself, which expands the boundaries of musical composition, creating landscapes of sound that unearth feelings, energies, and memories for which there are no words. In addition to her groundbreaking vocal and music theater pieces (which include “Book of Days,” “Dolmen Music,” “mercy,” “impermanence,” and “ATLAS”), she has created vital new repertoire for orchestra, chamber ensembles, and solo instruments. Her music has also appeared in motion pictures by Jean-Luc Godard and the Coen Brothers, among others. Her music has been presented by Lincoln Center Festival, Houston Grand Opera, London’s Barbican Centre, and at major venues in countries from Brazil to Syria. 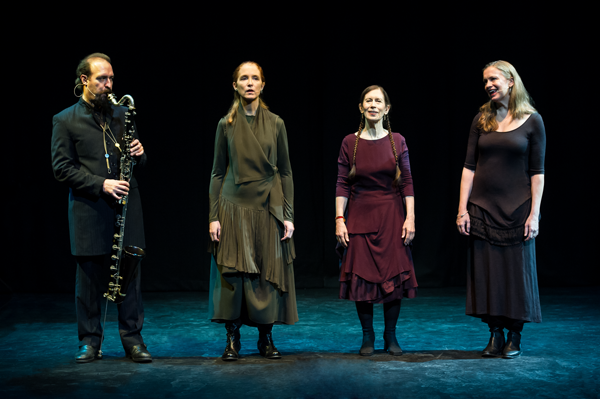 Meredith Monk’s numerous honors include a MacArthur “Genius” Award, two Guggenheim Fellowships and induction into the American Academy of Arts and Sciences. With a discography featuring more than a dozen recordings, mostly on ECM, her CD “impermanence” was nominated for a 2008 Grammy Award. In 2005, her 40th year of performing and creating new music was celebrated by a four-hour marathon at Zankel Hall. Another marathon, Meredith Monk Music @ the Whitney, was presented at the Whitney Museum in 2009, followed by the site-specific “Ascension Variations” at the Guggenheim Museum, featuring over 120 performers. Her new music theater work, “Songs of Ascension,” premiered at Stanford University in 2008 and won the 2010 Herald Angel Award at the Edinburgh International Festival. In March 2010, her newest commission, “WEAVE for Two Voices, Chamber Orchestra and Chorus,” had its world premiere with the Saint Louis Symphony Orchestra, followed by an April 2010 West Coast premiere with the Los Angeles Master Chorale at Disney Hall. In June 2010, Monk premiered “Education of the Girlchild Revisited” in Paris. In January 2011 she was named one of NPR’s 50 Great Voices and recently received a Courage Award for the Arts from Yoko Ono Lennon.